Christine has been a guest-speaker on TV and Radio Shows as well as on stage in France and the US. Christine Lewicki is a Certified Coach (PCC) and bestselling author (more than 300 000 books sold). She is also a recognized sought-after speaker who loves to express herself with her heart and guts. Clear, sharp and vibrant, Christine is able to captivate her audience by weaving humorous real life stories into her content rich presentations. She thrives at inspiring everyone to get out of victim mode and share their best self with the world. Christine is used to speak in front of rooms ranging between 10 to 2,000 participants. She can connect with your audience on stage as well as online via a web conference platform. Want your team to seek out solutions rather than point fingers ? 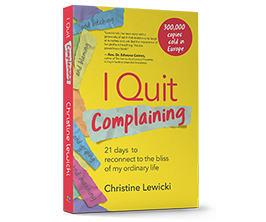 Christine will share her personal story when she decided to embark on a journey to quit complaining for 21 consecutive days. 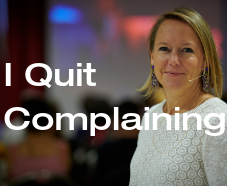 What is the hidden meaning behind our complaining and most important: how to quit! Alternating speaking, interaction with the audience and sharing among the participants, Christine allows each person the opportunity to experiment what could become possible if they could live a complaint-free life ! 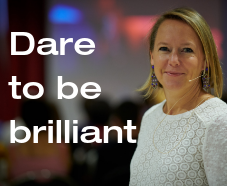 Dare to be Brilliant: What Does it Mean and Why Does it Matter? Deep in your heart you know your life could be more vibrant and rich. You know you are destined for more than what you are living. You’d like to dare be brilliant but you don’t know how to overcome your doubts and limitations. This conference will empower your audience to reveal their best self at work and with the world. Participants will understand how important it is for them to own their strengths and talents and activate them in their career. Do you want your team to feel fully responsible for their life and success? This conference will give the participants some very practical and profound tools to help them become entrepreneurs of their lives. With plenty of real life examples, Christine will share with the audience some of the best tools and tips that she’s been using at the center of her coaching practice. 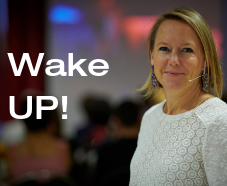 Participants will be left profoundly inspired and AWAKE! “Christine, thank you for speaking tonight. To my surprise, you touched parts of me that I was unaware needed to be touched.” – Susan Kaufer, Photographer. 1 wireless microphone for the room.